Yesterday was another day of trying to deal with the challenges of transitioning from a PC to a MAC while at the same time dealing with a nasty Trojan horse virus on my ASUS PC. This blog post, the 334rd in a row, took me about 3 hours to prepare. It was published at about 7:15am from my home at Indian Lake Estates, FL. Congrats to both the San Francisco Giants and the Kansas City Royals for a great World Series. The whole MLB post season was wonderfully exciting, and Joe Buck was superb. His Dad, the legendary broadcaster, the late Jack Buck, would have been quite proud of him. 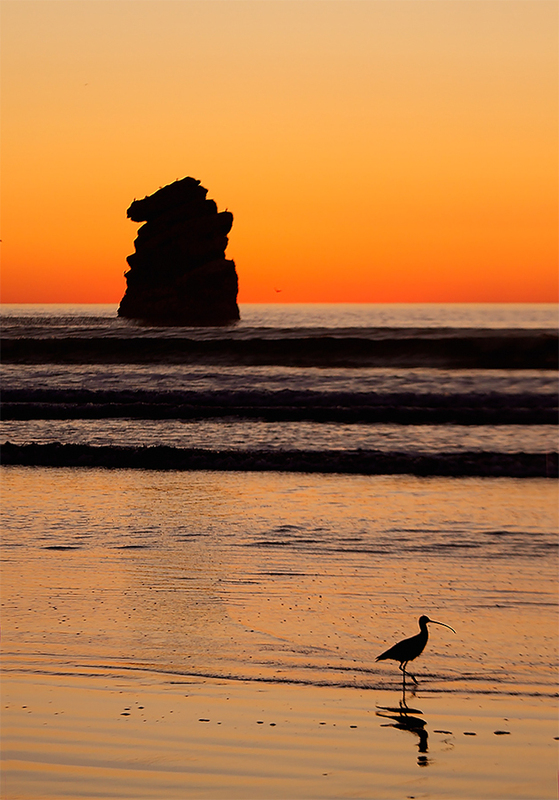 This image was created at sunset on January 12, 2009 with the Gitzo 3530 LS CF tripod (since replaced by the Gitzo 3532 LS carbon fiber tripod), the Mongoose M3.6 head, the Canon EF 800mm f/5.6L IS USM lens and the EOS-1D Mark III (now replaced by the Canon EOS-1D X.) ISO 400. Evaluative metering plus 2/3 stop: 1/320 sec. at f/5.6 in Av Mode. AWB. Both sensors above the central sensor were active at the moment of exposure with shutter button/AI Servo AF as framed. Click on the image to see a larger version. 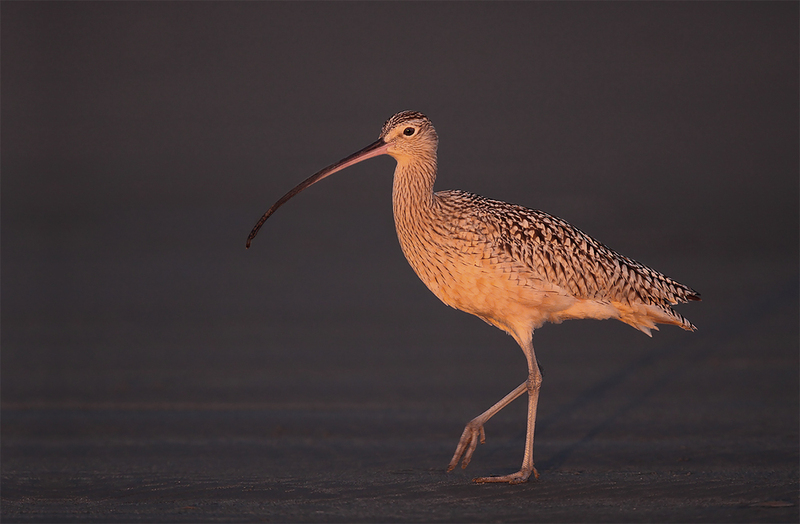 The target species for nearly all avian photographers visiting bird-rich Morro Bay, CA is North America’s largest most spectacular shorebird, Long-billed Curlew. 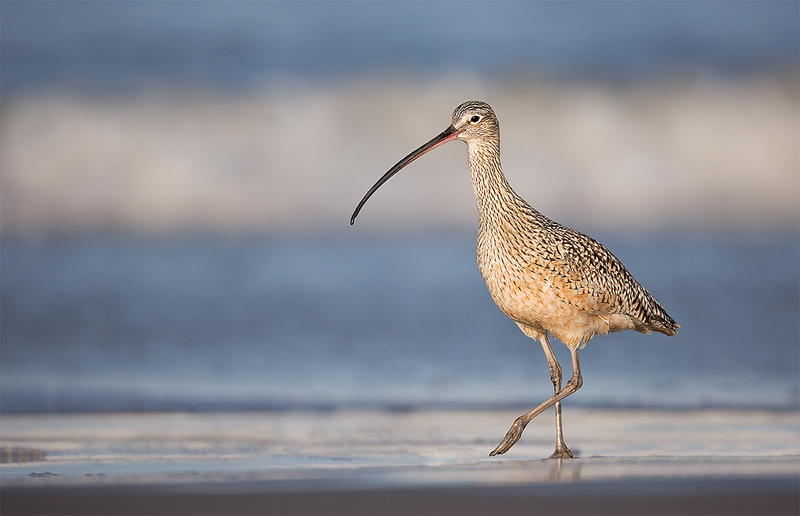 With their long decurved bills, these birds are adept at crabbing sand crabs on the edge of the surf (as above) and probing deep into wet sand and mud to extract fiddler crabs from their burrows. The bills of the females, which often exceed nine inches in length, are longer than the bills of the males. At Morro Bay they are fairly common and are often easily approached. This image was created on the clear morning of April 2, 2012 with the Gitzo 3532 LS carbon fiber tripod, the Mongoose M3.6 head, the Canon EF 800mm f/5.6L IS USM lens and the Canon EOS 5D Mark III . ISO 400. Evaluative metering plus 2/3 stop: 1/2000 sec. at f/5.6 in Manual. AWB. Two sensors to the right and two rows above the central sensor/Rear Focus/AI Servo Surround AF on the bottom of the bird’s neck as framed. Click here to see the latest version of the Rear Focus Tutorial. Click on the image to see a larger version. 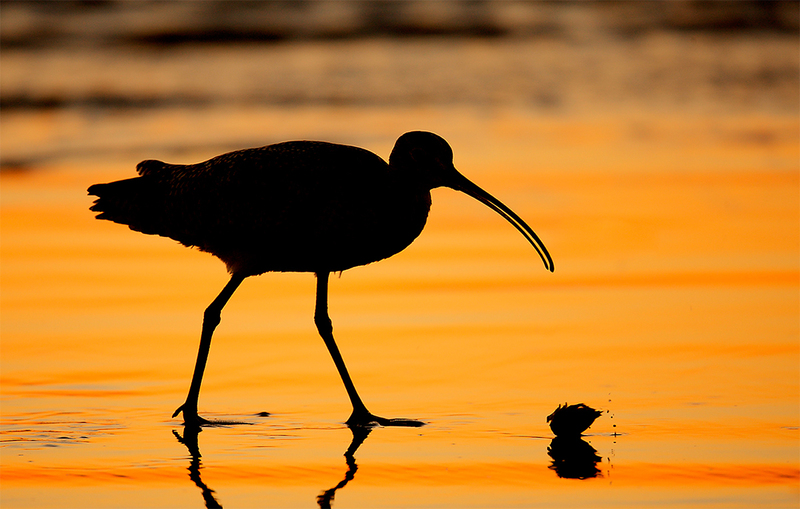 When photographing shorebirds, it is almost always best to sit down behind your lowered tripod or to lie flat down on the sand or mud. If the latter, you can splay the legs of your tripod or mount you lens on either a Panning Ground Pod or a Skimmer Ground Pod II. I prefer the former for gravel or fairly firm mud and the latter for soft sand. In general, images made while you are lying flat will be more intimate with more pleasing backgrounds. But most folks including me will not be able to easily follow walking or running shorebirds. And photographing an incoming bird in flight while prone is pretty much impossible for all but the most skilled photographers. Those tasks are relatively simple when you are sitting behind your lowered tripod. Assuming a constant subject size, remember that the longer your equivalent focal length, the farther you will be from the bird, and the lower your angle of declination to the bird will be. That will usually yield a more pleasing image. Score another one for the 7D II…. This image was created just before sunset on January 10, 2009 with the hand held Canon EF 400mm f/4 IS DO lens (now replaced by the Canon EF 400mm f/4 DO IS II USM lens) and the EOS-50D (now replaced by the Canon EOS 7D Mark II ). ISO 800. Evaluative metering -1/3 stop: 1/640 sec. at f/4 in Av mode. AWB. Central sensor/AI Servo shutter button AF on the bird’s breast as framed was active at the moment of exposure. Click on the image to see a larger version. Several folks have pre-ordered this combo using our BAA B&H affiliate links, Many thanks there. Expected availability for the new 400 DO is November 2014. Hey, that’s soon. Either 400 DO with a 7D Mark II will give you an equivalent focal length of 640mm in an easily hand holdable package that will produce sharp, high quality image files when in competent hands. 640 hand held will be perfect for the crane pool flight outs at Bosque… Add a 1.4X TC and that gets you to 896mm. Again, easily hand holdable for most, but you will need to employ excellent sharpness techniques (as detailed in ABP II). Put the lens on a tripod with a Mongoose M3.6 and you will be at 1280mm with the 2X III TC where the need for perfect on-a-tripod sharpness techniques will be even greater. This image was created just after sunset on January 16, 2009 with the tripod mounted Canon EF 70-200mm f/2.8L IS II USM lens and the EOS-50D (now replaced by the Canon EOS 7D Mark II ). ISO 400. Evaluative metering +2/3 stop: 1/500 sec. at f/4 in Av mode. AWB. Central sensor/One Shot shutter button AF on the bird and re-compose. Click on the image to see a larger version. Pink/purple/blue earth shadow sunrises (see the middle image on the Morro Bay card below) and red/orange/yellow sunset (and sunrises) are fairly commonplace at Morro Bay. And there is a great variety of silhouette-able subjects ranging from single shorebirds, flocks of shorebirds both in flight and on distant mudflats, ducks and egrets and gulls and pelcans, and flocks of cormorants. Note how I placed the curlew in the lower right of the frame to balance the knight-shaped rock in the upper left. Learn more about advanced composition and image design in The Art of Bird Photography II. ABP II: 916 pages on CD only. I really LOVE my new 7D Mk II it cost A lot less than my 1 Dx and it is A lot lighter to carry around , and more than that it has great Autofocus with the 500 F 4.0 with the EF 2.0 III for 1600 MM of Autofocus . Hope to see you in San Diego , Happy Birding . 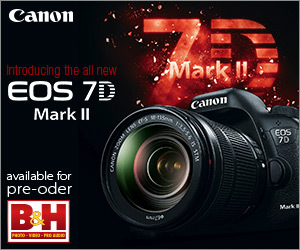 Why no comparison’s between the 7DII and Mark IV? In regards to ISO and image quality. The Mark IV may be obsolete but many camera’s are still out there. It would be a good gauge as to the real capability of the 7DII matched to an all time favorite birding camera such as the Mark IV. John, I am pretty much done with comparisons :). Many are doubting the methodology. The 1D IV is a great camera and it makes great images in the right hands. I have been saying here for years that folks are too much concerned with owning the latest/greatest gear and too little concerned with practicing, studying, and improving their in-the-field and Photoshop skills…. Re the comment “Remember that the longer your equivalent focal length, the lower your angle of declination to the bird will be. Score another one for the 7D II….” I’m confused by the comment. I may be misunderstanding some semantics in the comment, but I believe (in the engineering world anyway) the “angle of declination” is defined as the angle made by a descending line (or plane) with a horizontal plane (in this case, the horizontal plane is the ground). With that in mind, the angle of declination would not change at all with either different camera bodies or lenses as it is a purely physical angle of measurement based on locations alone. Let me know if that makes any sense :). Yes, that clears it up. For the constant subject size, as David points out the 7D II will put you farther away, thus lowering the angle of declination. I originally assumed the 2 cameras were at the same spot. Thanks for the clarification! Guru, after u replaced your 1D Mk IV with 1DX and 5D III; I thought you’d never take up a crop body again. Nice to see you did. All terrific shots (as usual), but that first one just blows me away. I love it! Lovely images of a spectacular bird. Typo: Under the first image you wrote “Januray.” How many times have I done the same….